I do not know whether you’ve come across cookbook author Diane Darrow or her food blog “Another Year in Recipes”? Well, I think she is fab – I like her hands-on approach and expertise in the kitchen, her take on matters culinary and wry wit. In the depths of darkest Winter when even here in Rome it got cold and snowed this year, I became entirely fascinated by her recipe for a Sicilian pasta bake called “pasta ncasciata”, which I subsequently found out hails from Messina. Diane has written not one but two blogs on this recipe which was inspired by her reading of Camilleri’s Inspector Montalbano series, the Sicilian sleuth who lives for his food (well, not just his food, but you know what I mean). I am a great fan of Montalbano too, only I watched the TV series and haven’t got around to reading any of the books. When we visited Sicily back in 2014, the house we rented was close to the town where his police headquarteres are filmed (called ‘Vicata’ in the TV version but called “Scicli” in real life) and we spent one day on the beach where Montalbano’s house is, Punta Secca, even eating in ‘his’ restaurant, the famed “Enzo a Mare” (https://myhomefoodthatsamore.wordpress.com/2014/08/02/montalbano-land-and-enzo-a-mare/). Everybody loved it, is all I can say. So, yesterday, with both our kids here and their cousins from England visiting, the undivided consensus was that I should make spaghetti alle vongole (spaghetti with clams). The young ‘uns went down to Rome, and ended being caught up in a monsoon-like flash flood downpour that had them trapped in a shop for almost an hour, while muggins here went food shopping up the road in overcast Frascati. Except that, this being THE annual holiday week in Italy (known as the week of “Ferragosto”), there were hardly any food shops open in town. And certainly not my go-to fishmonger’s. Well, that put paid to the clam pasta option and I had to rummage around in my menu memory for an adequate substitute. Which is when the pasta ncasciata came gloriously to mind, to save the day. Now, I’ll be honest with you: this is indeed a ‘fiddly’ dish and requires concentration and time. Things need to be salted, rinsed, fried, chopped, rolled bla bla bla and, finally, baked. So if you can get someone to help you out with it, good idea. Also, considering the amount of toil and steps involved, this would be a silly time to think small. I would suggest you make a large amount, as I did (i.e. 1 kg of pasta). You can always eat leftovers the next day. I bought all the ingredients, save for the pasta and eggs, and of course came home to find that I had run out of eggs (!) and that the only two 500g packets of ‘short’ pasta I had were of a different kind. Sigh. 1 kg of dry pasta (the short short shape), 1.6 kg of tinned plum or cherry tomatoes, 4 (or even more) large aubergines, 250g of minced meat (I used veal this time, I had used beef last time), panko-style breadcrumbs or dampened stale bread for the meatballs, 4 eggs total, 3 of which need to be hard boiled, finely chopped parsely, 2 medium-sized onions, 150g salami, 200g caciocavallo cheese (if you can’t find that, use a mild cheddar? or swiss or Dutch cheese … any cheese that will not overwhelm and that will melt when being baked), 150g pecorino cheese (if you can’t find this then substitute with parmesan), fresh basil leaves, olive oil for frying (yes – only olive oil, none other con be contemplated), salt and pepper. I favoured the Cirio brand for my tomato sauce. Originally, I thought that a large tin (800g) plus a smaller one (400g) would do the trick, but half way through the cooking I realised I needed more and added another small tin (400g). Thus: 1.6 kg of plum or cherry tomatoes in all. That’s the cubed salami on the left (150g) and the sliced (prior to be cubed) caciocavallo on the right (200g). I happened to have some already grated pecorino cheese in the fridge – see the jam jar in the background. I used all of that up, and had to grate some more to scatter over the pasta just before baking. On the left, you can see the breadcrumbs, the minced veal, the chopped parsely and the grated pecorino. I used 2 tablespoons of pecorino and ended up using 5 tablespoons of the breadcrumbs. I sprinkled some salt and pepper over the meat, and also just a teensy amount of freshly grated nutmeg. The second photo shows the egg, needed to bind the mixture. Combine all the ingredients using a fork or spoon at first and then your hands. Allow the huge meat ball to rest for a few minutes. Then break it down and make lots and lots of small meatballs, the size of a walnut. Lightly fry the mini meatballs in olive oil and set aside. (Later, pour the oil into the tomato sauce – see below). As you can see/appreciate, I chopped the onions any ol’ how. Added plenty of olive oil and cooked them, slowly, over a low heat. The onions must not brown, just go golden. And when they do, add the tomatoes and plenty of salt. Maybe even a hint of sugar. But perhaps later, not now. Those dark green specks are chopped parsely. I had some left over from making the meatballs so thought waste not, want not, sort of thing. Now: (1) Cook the sauce for 15 minutes, repeat: over a low heat that allows for a simmer. Add the fried meatballs, and cook for a further 15 minutes. Finally, (3) add a handful of basil and cook for a further 10 minutes. Total simmering time, roughly 40 minutes. Remove the meatballs from the sauce. Now taste the sauce, and find out whether more salt or sugar should be added. Cover and set aside. I did not take photos of the aubergines, sorry. But what I did was: slice them, sprinkle lots of salt over them, put them on a large plate and add a weight to press hard on them. The salt draws out some strange dark component of the aubergine which gives it its characteristic ‘bitter’ taste. The dark liquid you see in the photo on the left? That’s the stuff I’m talking about. FYI this photo was taken some time ago, when I was making a pasta dish with fried aubergines called “pasta alla Norma”. After one hour, I rinsed the aubergine slices more than once in plenty of running water. Then I squeezed them hard, ruining their shape in the process but never mind, and patted them dry as much as I could with kitchen paper. This procedure might sound peripheral to the final outcome but in actual fact guarantees that the aubergine will be fried to perfection! With none of the greasy heaviness that is usually associated with this nightshade vegetable when it comes to frying. They are notorious for their greed for oil ! If you really can’t be bothered, the other thing you could do is coat the slices with a fine dusting of flour. The flour will act like a sheath and prevent the ingress of unwanted oil. Unfortunately, but it can happen, some of my aubergines were full of seeds. I had to remove some in the course of the frying because I was worried the seeds might burn and impart a nasty taste. But I was lucky and this did not happen. Also, I tasted the olive oil in which the slices were fried (once it had cooled down enough, naturally! ), and it tasted really nice and, what’s more, quite ‘auberginey’. So I decided to add some of this oil to the final sauce. I poured the oil through a strainer to get rid of the seeds. Right – where were we? I’ll confess that this is when I went to the fridge and poured myself a glass of crisp white wine. What’s a gal to do, this is hard work. A lot of thinking required. At this point: The sauce is done, tick, the meatballs too, tick. The aubergines have been fried, tick. The other ingredients (except for the boiled eggs – which I didn’t make because I had only 1 egg in the fridge yesterday) are at the ready. Time to get cracking. This is when it gets exciting (amazing what a sip or two of wine can do). Put the water onto the boil. I did not have a baking dish large enough to hold 1 kg of pasta. So I opted for two smaller ones, to hold 500g each. Also, I had two different kinds of pasta to deal with, remember? So, I decided it was best to cook the pasta in two separate pasta pots. I read the cooking time, and removed the pasta 2 minutes BEFORE the recommended time. At first, I thought it would be a good idea to divide the sauce up equally between the two baking dishes. Then I changed my mind, and had to pour the sauce back into the original saucepan. I realised, silly me, that the pasta would have to be mixed in properly with all the sauce BEFORE going into the baking dish. So grab a big frying pan and pour all the sauce into it. The sauce was still warm, so I didn’t bother turning the heat on. 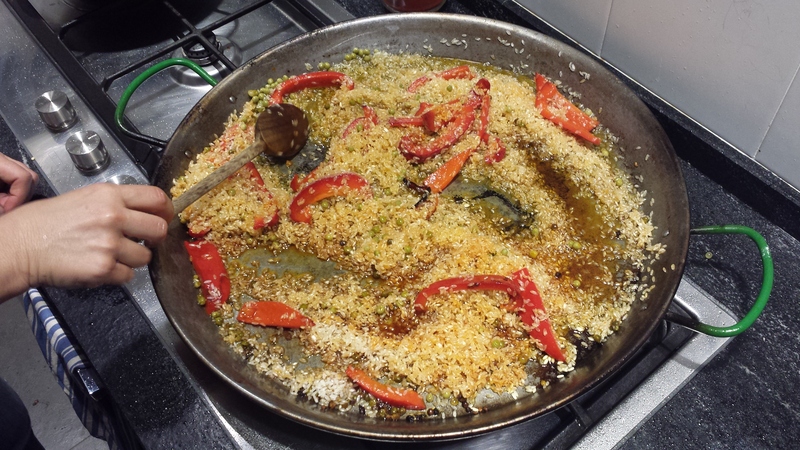 Sprinkle some grated pecorino into the sauce – about 50 g. This looks very Jackson Pollock, does it not? Add some of the oil that was used to fry the aubergines. Mix well. May I remind you that I was using extra virgin olive oil – I wouldn’t dream of doing this with any other oil. Now that the pasta is cooked (but slightly undercooked, remember? ), drain it directly into the large sauce-filled pan and use a wooden spoon to make sure all of it is coated. THE OVEN SHOULD BE TURNED ON AT 200°C. Basically, there are three ‘layers’ to this dish. Layer the pasta first, then add slices of aubergine, some meaballs, some salami and caciocavallo and a scattering of grated pecorinio. Repeat until you run out of everything. Take a look at the following 4 photos of the first baking dish, an ancient pyrex dish that goes back to the 1970s I think! Notice how I added more fresh basil leaves in the third photo, before adding the last layer. If you leave the basil leaves on top, they will naturally burn during their stay in the hot oven. Here are four other photos of the other baking dish, a lovely green ceramic one. AI I had set some of the drained pasta aside because I was worried that the sauce might not be ‘thick’ enough to cover the entire 1kg amount. There was, instead, a little bit of sauce left over, and so I now used up the dregs of the pasta and the sauce. This was a much ‘lighter’ pasta (i.e. less sauce). I divided this up between the two to act like a ‘lid’ over the rest of the goodies below. I also grated a little bit of pecorinio cheese over them. Think of this as a final topping. I apologise, I have no photos to show of the baking dishes just before I put them into the oven. I did put a lid on both of them. They baked for about 40 minutes, at 200°C in a fan oven. And then we have leftovers the next day ! What can I say? Marvellous! P.S. If you read Diane Darrow’s recipe (see link below), she does not include the meatballs. I found the addition of the meatballs in many other recipes I researched on the internet and decided I liked the idea. Like Diane, I had used mozzarella on my first attempt but have to confess to preferring the caciocavallo second time around. I would not like the idea of mortadella, not because I don’t adore mortadella, but it does hail from Bologna and this is a Sicilian dish after all. And ssssh, don’t tell a soul, we didn’t miss the boiled eggs in the least bit. But to each their own, there is no arguing over personal likes and preferences as even the Romans used to say in their adage “De gustibus non disputandum est”. I keep scratching my head for a vegetarian version – you know, no salami or meatballs. I excpect it would taste pretty good too, why not. Maybe ramp up the amount of pecorino used. Thank you Diane Darrow for inspiring me! The thing about Pasta Alfredo is that it is basically well known only outside of Rome and especially in North America. 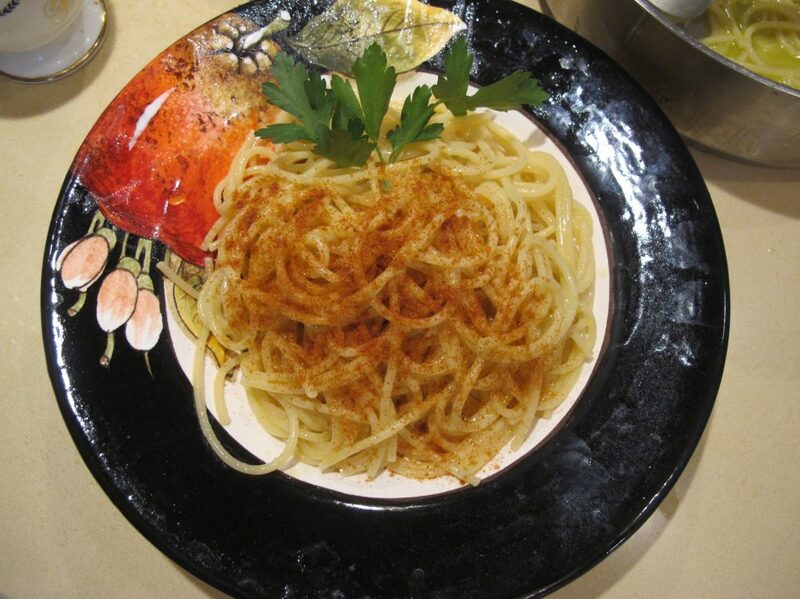 There are two restaurants in central Rome that that can lay claim to the origin of this recipe and it became famous because famous foreigners got to enjoy it, including early Hollywood film stars. If you have a little gander around google you will encounter scores of articles to enlighten and amuse you. If you haven’t got the time or patience, I would advise you to click on the links below for two excellent articles and video on the history and the recipe written by Elizabeth Minchilli and by Frank Fariello. For my part, I can say that most Romans – if they are going to make a simple butter and parmesan pasta at all – will not use fresh pasta (fettuccine) but dry pasta instead. The recipe is sometimes dubbed as the dish that is made for the man whose wife cheats on him (“la pasta del cornuto”); having squandered her time away from the kitchen in pursuit of forbidden pleasure and frippery, she will not have the requisite time to prepare a ‘proper’ pasta sauce. What else can a poor unfaithful wife do but resort to a quick and easy “pasta burro e parmigiano” that she can prepare in no time at all? As if. Anyway, I got a craving for this dish when I was pregnant the first time – so it was very amusing for me to discover that the original chef Alfredo who ‘invented’ this concoction did so in order to improve the appetite of his pregnant wife! There you go. Nothing to do with being unfaithful whatsoever. Also, it is the pasta to make after one has been ill for whatever reason. “La pasta in bianco” it is called (white pasta) and sometimes olive oil will be substituted for the butter. In Umbria they call it the Englishman’s pasta. I wrote a post about this some years ago: https://myhomefoodthatsamore.wordpress.com/2014/03/02/english-pasta-spaghetti-burro-e-parmigiano/. But back to today and the new pasta Alfredo I want to tell you about. The Alfredo in question is Alfredo Minardi Baldoni who runs his family’s nine-generation vineyard and olive farm near Frascati. The vineyard and farm house/cellar couldn’t be prettier and more picturesque, with breathtaking views of the rolling hills of the Castelli Romani area, the peak of the ancient town of Tusculum, the town of Monteporzio, as well as the hills north of Rome and the seashore to the left. I have been collaborating with Alfredo and his tours and wine tasting since last September, and our conversations are always about the history (and a bit of gossip) of where we live, wine (naturally! ), olive oil and food. It didn’t take me long to discover that he likes his nosh, has a fine palate and is a dab hand in the kitchen. I was telling him about that incredible pasta sauce I had enjoyed in Tuscany back in October, consisting of only three ingredients: sausages, mascarpone, and parmesan cheese (salt and pepper too). When we were discussing what two pasta dishes to offer our guests one Sunday, we decided go for a traditional Roman dish (Amatriciana) and to do a take on the famous (or infamous considering the ‘heavy’ ingredients) of the sausage-mascarpone-parmigiano recipe. And this is the result. “What are we going to call this dish?” I asked him, minutes before serving the guests? He started prattling on about the ingredients and I shook my head. “No, we shall call this dish Pasta Minardi, after the vineyard!” I can take no credit for the tweak on the trio of ingredients, the ideas were all Alfredo’s (except maybe for the addition of mint). And hence, some time later, I reckoned it was a good idea to name this dish “Pasta Alfredo Frascati Style”. Italian sausagues, mascarpone, freshly grated parmesan cheese. A handful of almonds, a glass of white wine (Frascati naturally! ), some olive oil and as much or as little garlic as you prefer. Use a knife to finely chop the sausages after having skinned them. Then brown the garlic in the olive oil, taking care not to actually ‘brown’ them. They ought to be a golden colour. Remove the garlic afterwards (or keep it in the sauce, if you like it). Add the chopped sausage to the pan and use a wooden spoon or spatula to break it up as much as possible. Careful not to overcook the meat otherwise it will tend to go all hard and chewy. You can slice the almonds with a knife or you can do what I did. I covered them with parchment paper and used a meat pounder to crush them. When the meat has just stopped turning pink, pour a glass of white wine into the pan (not directly on the meat) and turn the heat up to let the alcohol evaporate. Now add the almonds. Stir. The meat looks really ‘brown’ in the above photo but that’s not what it looked like in real life. Anyway, I added 4 tablespoons of mascarpone and mixed it in. I then added a fifth tablespoon to loosen up the sauce somewhat. I tasted it (delicious already!) and added a little bit of salt. Pepper (freshly milled) I always add at the end. The pasta was boiling away (doesn’t look like it in this photo, I know). I used roughly 700g of pasta. I transferred the sauce to a larger pan. A pan that I would use to finish off the pasta. At this point I added a few teensy mint leaves that I found on my balcony. Dried mint can work too, I suppose. The pasta was almost ready, so I turned the heat on. I had added some pasta water to the previous pan, to soak up whatever got left behind. I poured this into the new pan and then drained the pasta directly into the pan. Here I am finishing off the pasta in the pan, adding more pasta water (as needed) and tossing and or stirring the pasta. Pepper and parmesan last. Give it a good stir and serve. A lovely wintry recipe, my appreciative guests commented as they enjoyed Pasta Alfredo Frascati Style a few evenings ago. I should think so so too. This might not grow hair on your chest, but you will find yourself breathing better as you savour the richness of the texture, the crunch of the almonds, the saving grace of a faint hint of mint and the rounding off of a parmesan-mascarpone finish. The queen of summer dishes is the Parmigiana di Melanzane, of course. Slices of aubergine fried in olive oil and then baked in the oven with mozzarella, basil, parmesan and a tomato sauce. It is, however, a dish that requires an attitude of reverence and plenty of time for its production. One evening a few weeks ago, I decided I would settle for an aubergine recipe that would use the same ingredients basically but at the same time offer the bonus of taking less than an hour to prepare. I also decided to go for this recipe because … the aubergines and tomatoes I had to hand weren’t exactly the best quality. I am a bit of a bore when it comes to where to do one’s food shopping and I have been avoiding/boycotting supermarkets for many years now, ever since I read the book by Felicity Lawrence “Not on the Label”, circa 2005/6/7 … can’t remember exactly which year. I realise I am at risk of coming across as a terrible snob, with supercilious standards, especially with regard to people who go to supermarkets for reasons of economy. So I hasten to add that Frascati, which is where I live, is a very short distance to many markets: our own Frascati covered market open Monday to Saturday and a Slow Food Market every Saturday morning, both of which I can reach on foot; then there are farmers markets in the area (Ariccia), and weekly markets (Grottaferrata on Mondays, Cocciano on Wednesdays), as well as a couple of farms (Capodaraco in Grottaferrata and Iacchelli not far from Nemi). And not only do the prices of their wares compete very favourably with supermarket prices but … their produce is infinitely better on the whole, it really is, no contest! I am nearly always disappointed when I buy veg from a supermarket. Which fortunately does not happen very often. Anyway, it just so happened that I had some dodgy looking aubergines and tomatoes sourced from, you guessed it, the supermarket. Their look wasn’t exactly a come-hither one and the only answer for me to such a strait (that perhaps only I deem to be dire) was to go down the tasty camouflage route, i.e. to take recourse to frying. As they say in Italian, even the sole of a shoe would taste good if it were fried. Aubergines, tomatoes, basil leaves, breadcrumbs, eggs, mozzarella, good quality extra virgin olive oil, oil for frying (either olive oil or groundnut/peanut oil). Salt. The first thing to do is rip the mozzarella and put it in a sieve or colander so as to dry it up a little, remove the excess of its liquid. These tomatoes looked pretty enough but … their taste left a lot to be desired. I had a little bit of tweaking to do in order to amp up their flavour. Cut the tomatoes in half, and then half again, place in another colander and allow them to drip away. And here is the prepping station. Some beaten eggs in one plate. Some breadcrumbs in another. The unprepossessing aubergines. I peeled them, cut them into fairly thick round slices. I then coated them with the egg wash before breading them on both sides. Be sure to press quite hard. Fingers get to be incredibly sticky and require frequent rinsing (especially if the phone rings – now why is it that the phone tends to always ring or the neighbour call in when I am in the process of frying food? Maybe the anti-frying police is after me.). Off I went and shallow fried the aubergine slices. Turning them over only once. I removed them with a slotted spoon and set them over a plate with kitchen paper to welcome any unwanted oiliness. And now back to the mozzarella rags. I put them in the food processor with a tablespoon of extra virgin olive oil. I used the pulse feature to process them. I seem to remember adding 1 tablespoon of very cold water, to ‘loosen’ the mozzarella as it were. I stopped the blitzing and tasted the mozzarella. I decided it required a little more olive oil. A good sprinkle of salt and white pepper and some fresh basil leaves. A little more blitzing and it was done. And here, dear reader, is my loosey goosey mozzarella topping: easy peasy! It was time to put the ingredients together and serve the dish. I added a little dribble of olive oil to the tomatoes as well as a tiny sprinkle of salt (sea salt, always sea salt). And for all my lamenting and decrying over the quality of the aubergines and tomatoes, this recipe turned out to be very good indeed. All of the aubergine slices got wolfed down and a sense of summer satiety obtained at the dinner table. Frying can work miracles, I tell you. During the past few years I have occasionally given private, mostly individual English lessons that are all about the person in question, wholly tailor made to fit in with their level of comprehension of the language and, almost as important, their character, their personality, and age. Anyone grappling with the challenge of learning a new language nearly always suffers from the excruciating pain of looking foolish, I find, and the result is that even outgoing people end up being on the shy side. It is important that I succeed in getting them to overcome this hurdle, how else otherwise will they be able to make any inroads? I often take recourse to songs and nursery rhymes, the sillier the better. People feel okay about ‘repeating’ the words of a song or a ditty because it somehow shields them from exposing their tender language-impaired ‘self’. And if there is a little laughter or a chuckle to be gained thereby, all the better. Nothing like a little sense of humour to shake things up a bit, it can do so much to encourage a little courage. A good song is “O dear, what can the matter be? Three old ladies locked in the lavatory”, etc. The first verse is fine but things get very complicated, vocabulary wise, after that. I will introduce it only when we have reached a certain level of understanding. Much easier to begin with the famous, or infamous if you will, baked beans song. You know the one, don’t you? So eat baked beans with every meal. I heard the song for the first time when I went to boarding school in England where I learned that flatulence enjoyed pride of place in giggledom. Farts, and bathroom jokes, I soon discovered were the origin of much hilarity. So noblesse oblige, I joined in and even participated in a farting competition in my dormitory one night. I hasten to add that I soon outgrew any fascination for the subject or its physical expression anywhere near my presence. In one dictionary I looked up the word ‘fart’ in at the time the explanation was quite mind boggling: “a slight explosion between the legs”. I have a lot of respect for the workings of a healthy body, and any unwanted air must of course be allowed to escape, bar the risk of it rumbling uncomfortably inside the body. That is what I informed my children when they were young. That said, the bathroom was the best place for its evacuation unless extreme conditions obtained, in which case it would be a good idea to excuse oneself. I realised that it was a fine line between presenting the act of farting as a ‘normal’ bodily function and casting a socially shameful light on it. Why preface a post with all this talk of flatulence, you might well ask? Well, the reason is actually quite a bittersweet one. My mother had to undergo surgery on her brain last summer to get rid of a haematoma. Considering her age, almost 90 at the time, she came through it all with flying colours. The doctors suggested she stay off blood thinners for a while, and all was well until a few months ago, when she began to suffer from very strong atrial fibrillation. After much to-ing and fro-ing with the cardiologist and blood tests etc, it was decided that she should be put on blood thinnners, the Coumadin anticoagulant also known as Warfarin, to avoid the risk of a stroke. Aged 90 plus now, she passed her yearly driving test on the Monday, and was told by the cardiologist not to drive on the Tuesday. That didn’t go down well with her and she started driving again as soon as her fibrillations abated. Not that she drives any long distance, bless her, basically only within a 3-5 km radius, but being able to drive is what keeps her ticking. Here is my mother, Agnese, a couple of Sundays ago. At a garden party lunch. Another thing that keeps her ticking is cooking. My love of food and cooking has most certainly come from her, and a lot of our conversations over the phone are all about recipes or ideas for a recipe or talk of what she found at the market. So imagine telling someone like her that they have to restrict their “healthy” food intake. Crestfallen by the appalling implications of this bloody Coumadin stuff, I told the second cardiologist that to me it sounded like a death knell for her. Thankfully, he was very sympathetic. And, indeed, hopefully within the next ten days she will be put on another kind of anticoagulant medication that does not interfere with the diet and does not require periodic blood tests. Phew. Please take a look at what she must avoid until then. Let me translate for you. “Drinking grapefruit juice, cranberry juice, and alcohol during treatment with warfarin / coumadin can increase your risk of bleeding.” “Steer clear of green apples and prunes.” In one of the websites I researched on the subject, even extra virgin olive oil was supposed to be eschewed save for a dribble. In other words, with Coumadin we are basically being told NOT to eat a Mediterranean diet, the one that is now proven to be so good for us! How do you think my mother got to celebrate her 90th birthday? I felt very badly for my mother and when she came over for supper day before yesterday, I wanted to cook something that would seem ‘normal’ and not smack of that dreaded word ‘obligatory’. ‘Choice’ is such a pleasing sounding word, isn’t it. At first I thought I might do something with beans, not the proscribed fresh ones but the ordinary cooked kind. My mother doesn’t like chicken much, the only meat she really enjoys now is pork for some reason but of course she isn’t allowed that, it wasn’t a fish day, she wasn’t allowed eggs … ouff! … so beans sounded like a good kind of protein. Except that I then thought of the beans’ ‘explosive’ consequences … and that’s how I came up with the idea of the recipe for a potato cake drowned in a cream and pecorino sauce. I take no credit for the recipe, I saw it on a television programme recently. Boil the potatoes (in my case it was only 1 large potato), mash, allow to cool and set aside. Slice or chop the onion and sweat it with some olive oil in a saucepan. Then add the tomato sauce, some salt and a teensy pinch of sugar. Cook for about 10-15 minutes, adding fresh basil leaves a few minutes before the end of the cooking time. Taste and season again if needed. Now, add the mashed potatoes and gently combine with the tomato sauce. It doesn’t take long to combine all the ingredients nicely, over a low heat. Use two spoons or a wooden spoon to shape the potato mix in to a round ‘cake’ shape. Continue cooking until you think one side has been nicely ‘done’. Then, using a plate, flip the potato cake and slide it back into the pan. The potato cake can now cook on the other side. Pour some cream into a small saucepan and add some nutmeg (my idea) and the cheese. Cook until the cheese has melted. At this point, I switched everything off and decided to make my mother a good old-fashioned tomato bruschetta. It was that beautiful time of day, when one can enjoy a glass of wine and contemplate the cinematic performance of a Summer sunset. Nature can be such a ham at times. I got my husband to lay the table. He kept my mother company as she enjoyed her sundown bruschetta on the balcony. I stayed in the kitchen getting on with our meal. My mother had brought some tripe she had made earlier. Trippa alla romana, which my husband loves. So, heating that up and covering it with pecorino was easy enough. There had been no mention of green beans being dangerous in any way. So, I had prepared some with a clean conscience. I pan fried some breaded beef slices. Who doesn’t love a “fettina panata” now and then? I heated up the potato cake and then slid it onto a plate. I apologise for the photo, not a good one. I heated the pecorino cream sauce and poured it over the potato cake. Rustic tablecloth, colourful combination of various hues – thorougly unsubtle at that. Sometimes, it’s a good idea to go for ‘cheery’ even though it’s a mite over-the-top. Dinner was ready to be enjoyed. And enjoy it she did, phew. My mother said it was really nice. She did not eat all of it and took the rest of it home later. Grapes were fortunately also not on the Verboten list. And all in all we had a lovely evening, followed by watching the film “Florence”, with Meryl Streep and Hugh Grant. The moral of this story? The enjoment of food, especially at a certain age, is an essential part of a life worth living. Do not let dour medicine get in the way of it. Get thee hence Coumadin. Roll on the new medication. But in the meantime, even a ‘restricted’ meal must appear to be inviting. Sometimes it is easy to forget how a handful of readily available ingredients are all that it takes to make a simple fish taste so good. This couple of ‘orata’ (sea bream) were caught from near Civitavecchia, or so the fishmonger told me as he gutted them and removed their scales. One orata for me, one for hubby, they weighed about 700 g each. When I got home, I rinsed them again in running water, and patted them dry. I put some flour aside for coating them later on. In the saucepan to start with: olive oil, butter and some sweet paprika. Once the heat was turned on, I added some garlic, minced parsely and about a teaspoonful of coriander. After flouring the fish on both sides, I lay them gently into the bubbling olive oil and butter. I did my best to turn them over without removing any of the skin, but as you can see, I wasn’t entirely successful. I had some white wine on standby. Once I deemed the fish to be cooked, I placed them over a bed of plain peas seasoned with a little bit of butter and salt. I poured some wine into the saucepan, turned the heat up in order to let the alcohol evaporate, and then poured whatever lovely juices remained through a sieve all over the fish. On the table and ready to be served. Doesn’t look like much, and yet is was so satisfying (all that butter folks! and the nuance of paprika and coriander) and very pleasant to eat. Also on the menu was saltwort which had been blanched first and then cooked through in another saucepan which was waiting for it with crispy guanciale (pork jowl) and all that that entailed. It’s the first time I served ‘barba di frate’ or ‘agretti’ as saltwort is called in Italian this way. I know it won’t be the last. I think it took me less than 20 minutes to make this dinner. Our friend Neve is an artist who can’t help but infuse her creative bent into her cooking. Or her kitchen, I love the entrance to her kitchen. And was preceded by a delicious gazpacho. 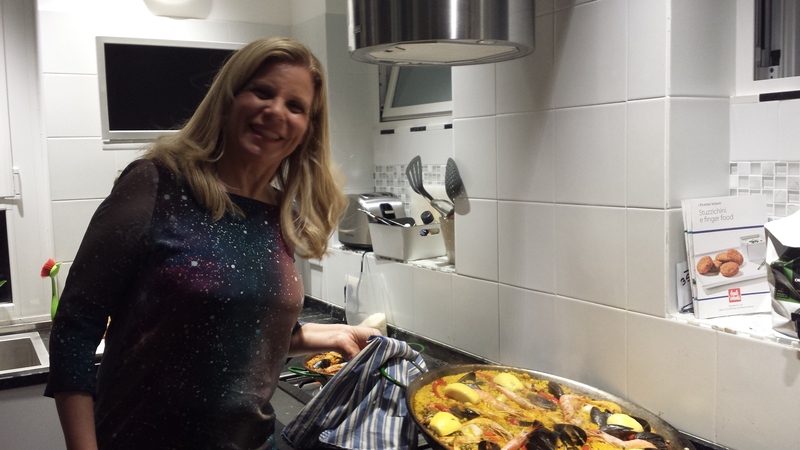 But now … on with Neve and HER paella. It all starts with a dog. 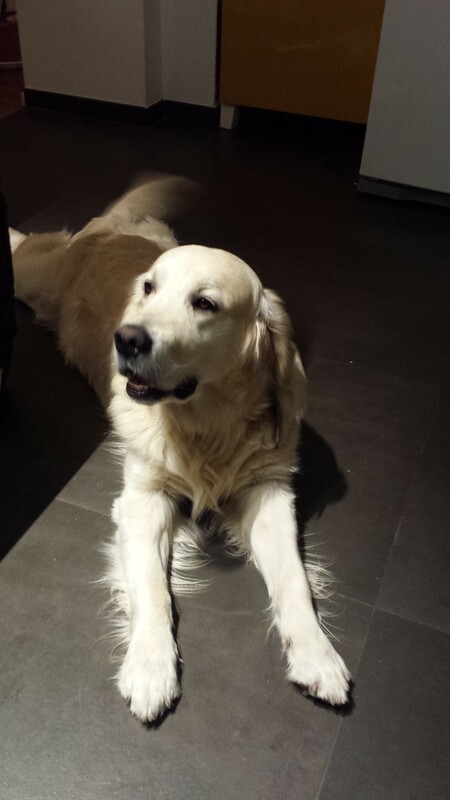 You have to have some kind of pet or loved one to keep you company as you cook. Meet Walter. The family dog. Neve says that one has to be thoroughly organised and have all the ingredients and equipment at the ready so as to avoid dither. Hence … large clean glass or mug (to use as a measuring cup), a water jug, the rice. Peeled and sliced onions and garlic, olive oil (lots of olive oil! ), red capsicum and peas or green beans in one bowl. Sweet paprika (“pimenton”). Cleaned fish in another bowl. Manila clams somewhere else and, last, whole prawns. Also needed are a few pinches of saffron, salt and 6 lemons. Cut 4 lemons into wedges and squeeze the other two for their juice. One glass of rice per person. Two glasses of water per glass of rice. Pour all the water inside a water jug to make things easier (that way, you don’t have to keep running to the tap to refill the glass). It is also mandatory, I would say, to use a proper paella pan. Indeed, the pan itself is called a ‘paella’. The Spanish colonization of southern Italy must surely have something to do with the fact that the Italian word for a pan is “padella” ….? 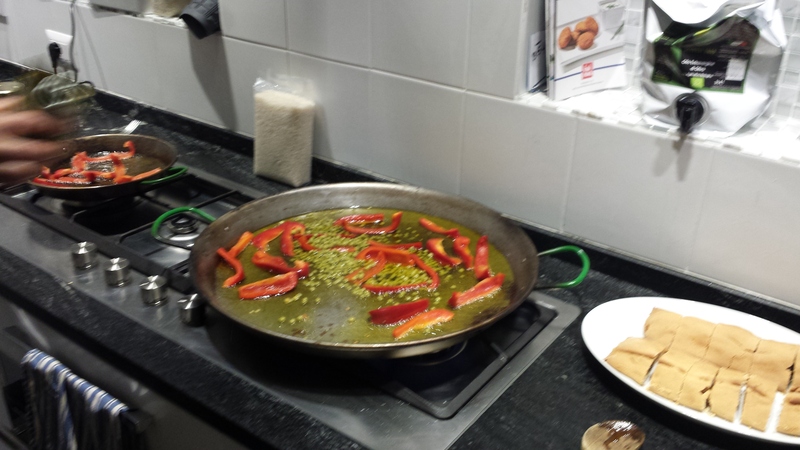 It all begins with a good amount of olive oil spread out over the paella pan. 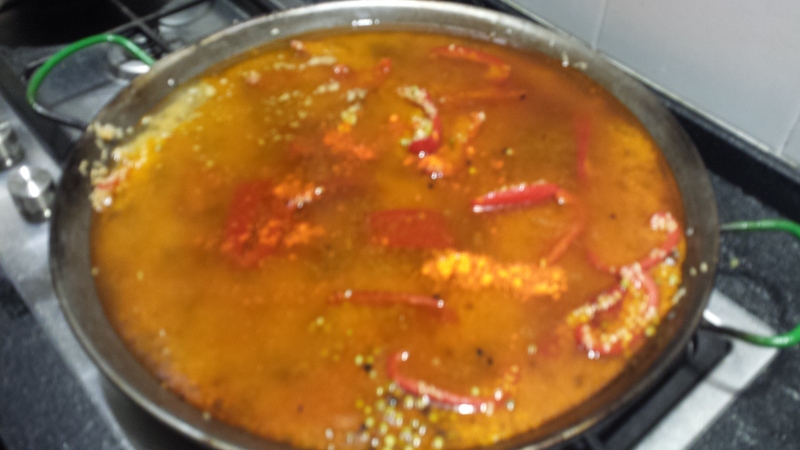 Enough to cover the entire surface of the paella. That means a lot of oil, don’t be afraid ! Switch the heat on, cook the onions and garlic over a low heat, and then scatter some peas (frozen at that) and slithers of de-seeded red capsicum (red peppers). Very low heat, we don’t want to scorch the ingredients, just make them ‘mellow’. A prodigious amount of “pimenton” is then added, i.e. the sweet paprika. In went the rice, all in one energetic go. And, by the looks of it, Neve proceeded to spread the rice and let it ‘toast’ for a bit – not unlike the procedure for making risotto. One big difference is that the rice has to be spread very thinly in this case. Sprinkle salt over the rice before spreading it around. Rice, after all, requires plenty of salt if it is to acquire flavour. 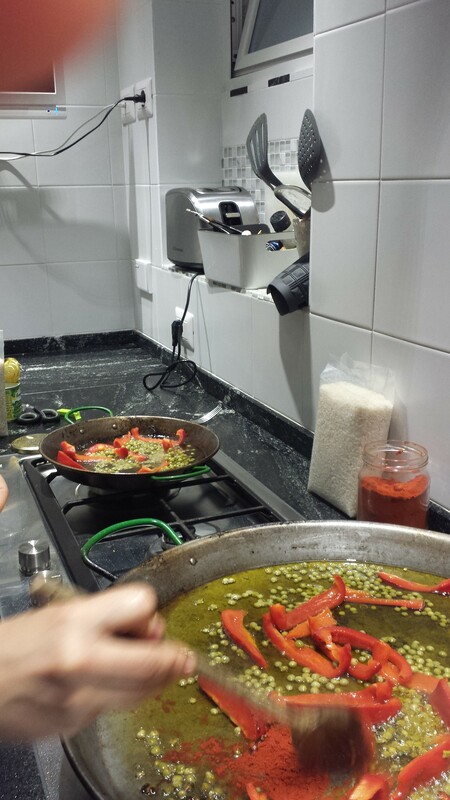 Oh and about the rice in question, if it can’t be the Spanish bomba, it should at least be a short-grained one (i.e. the oryza sativa): no basmati or jasmine or other Oriental rice. I expect Neve used a plain Italian Arborio rice. Time to add the water to completely cover the dish. Now also add the pinches of saffron. The saffron should not overpower the taste of the delicate fish. A vast (and very expensive!) amount is certainly not required. 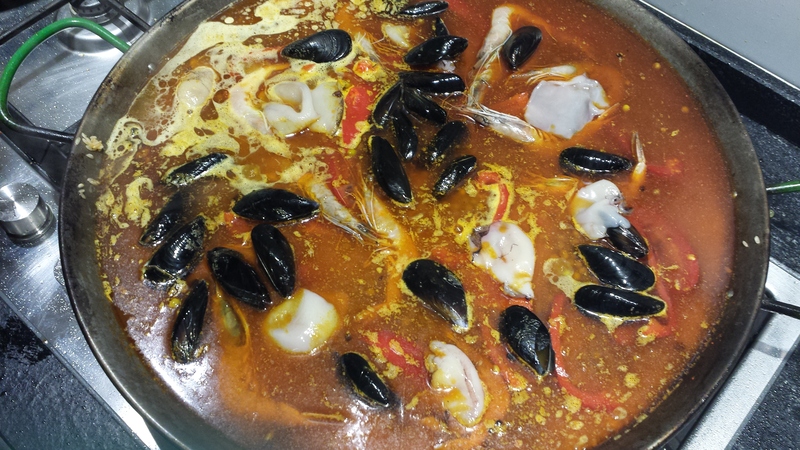 Fishy flavour can be called into play now, in order to enhance the broth, with the congregation of mussels and calamari that are introduced at this point into the bubble, bubble, toil-but-no-trouble paella. At no time did Neve stir the rice. If anything, the rice must be left well alone until all the liquid has been absorbed, and left to cook longer than one would think. That is because it is supposed to develop some crust underneath, as well as around the edges. Neve added prawns too, but later on, after about 15 minutes (they take less time to cook). 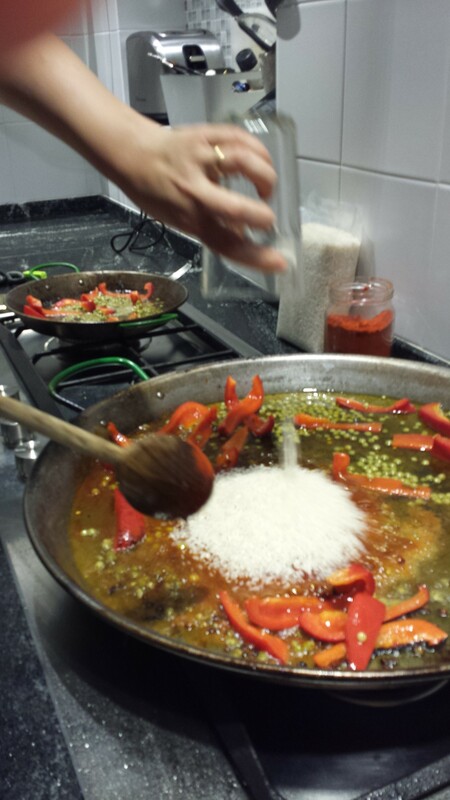 Her advice is to sink and lightly crush their heads into the rice (using a spoon or toothpick) so that any liquor can also go into making the paella tastier. 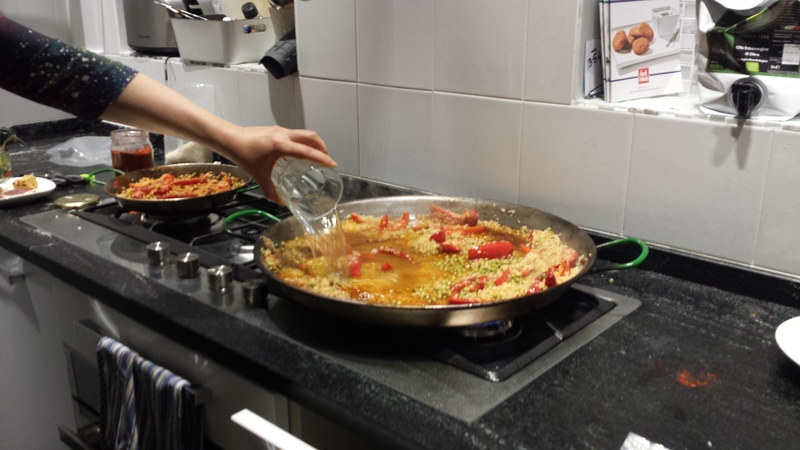 When she deemed the dish ready, she infused the paella with plenty of lemon juice. She then decorated it with wedges of cut lemons. Now is the the last-minute tweak moment: turn up the heat so as to allow the bottom part of the rice to develop a crunchy crustiness. Then, obviously, switch the heat off. And remove from the burner. Looking good, eh? Final touch? 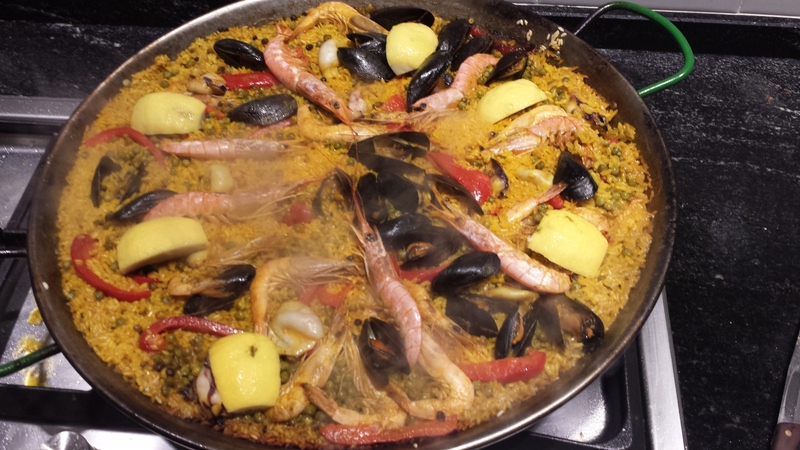 Spread a clean tea towel over the paella so that the steam can imbue its magic, helping the overall texture of the dish. A paella should be served just warm … never hot. Squeeze more lemonjuice if you so desire. By the way, you will be surprised to discover that all that oil ‘miraculously’ disappears into deliciousness. Skimp on the oil and your texture will be brittle and horrid. Walter heartily approved ! Gracias, grazie, thank you Neve! P.S. 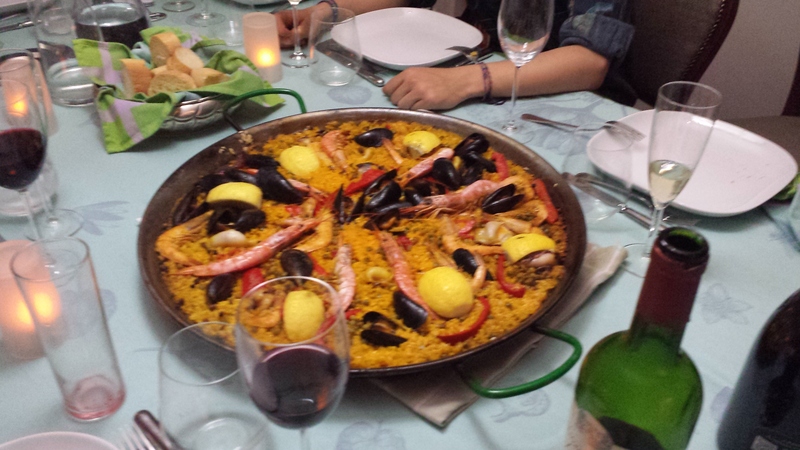 If you are interested in what makes a true paella, you need to read about Guillermo Navarro. It is he who has been behind the wikipaella.org pages. Anyone who has lived in Italy for any length of time, or even visited it for a brief spell with a gastronomic field trip in mind, will come to know that fish and cheese are not bed mates in this country. Horror of horrors to any law abiding Italian is – perish the thought – the addition of parmesan or other cheese to any pasta dish featuring a creature of the deep or even surface seawater. The only exception I am aware of is pasta using mussels and pecorino. And then, out of the blue, my English friend Michelle Smith who has lived here for over 35 years tells me that one of her favourite seafood pasta dishes involves swordfish and pecorino. Well, you could have knocked me down with a feather. “Doesn’t the pecorino overwhelm the swordfish?”, I enquire with eyebrow raised and lips pursed to one side of my mouth in disbelief. She assures me that it does not though of course one mustn’t overdo it with the grated pecorino. Hmmm. The thing is … my family are not great lovers of swordfish. The last time I even ate swordfish was in Sicilly, during a memorable holiday in July of 2014. We had lunch at the family restaurant on the water which is featured in so many Inspector Montalbano TV series, called “Enzo a Mare” (https://myhomefoodthatsamore.wordpress.com/2014/08/02/montalbano-land-and-enzo-a-mare/). And then Friday afternoon (Tuesdays and Fridays are the traditional days for eating fish in Italy) I decided we simply had to have some fresh fish for dinner. So off I trotted to Monteporzio Catone, a little town up the hill from Frascati, where I know I can find a very good fishmonger open in the afternoon. The first thing I espy are oysters, French ones at that, and so I make my mind up on the spot that I shall need a few of those just to get me going on the supper. I look around and decide that, though I may not marry pasta with it, it’s about high time I had a go at swordfish and pecorino. And while we’re at it, why not get some juicy anchovies to fry, dusted with flour? A big fat thick slice of swordfish, some gutted anchovies and a lovely bunch of saltwort – barba di frati or agretti, as they are called in Italian. The agretti are blanched in salted water, draind and set aside. The anchovies are thoroughly dusted with flour. They are then deep fried in groundnut (peanut) oil at the appointed time. I also found some lovely asparagus, which I trimmed and washed and then sliced into two or three constituent parts. I proceeded to simmer them in salted water for a minimum time, drain them and quickly plunge them into cold water to stop the cooking process. I know that I shall have need of both lemon, oranges and parsely. The lemon was from the Costiera amalfitana and the orange from Sicily. What a lucky girl I am indeed. Once the asparagus had cooled down, I placed them around the edge of a large platter. And added some orange slices in the middle. And now it was time for a bit of cheesy alchemy. Olive oil, lemon juice, chopped parsely, grated pecorino romano cheese … and a squeeze of orange juice. And a squeeze of lemon juice. Process all the ingredients. Taste … and add a bit of water, a bit of salt. The final flourish is the glug of olive oil (evoo naturally). Stir and stir, taste and taste, add a bit of this, add a bit of that … and Bob’s your uncle. This is definitely not the typical Sicilian salmoriglio sauce but … even so … most adequate. The pecorino is hardly detectable as an individual ‘cheese’ component, and yet imparts some sense of oily gluttony that is just the business for this sauce. Pat the swordfish steak until it is dry on both sides, using kitchen paper. Time to get dinner on the table! Plenty of olive oil and plenty of dried oregano (I don’t have fresh at this time of year, sorry). Once the heat has got going, add the steak and cook on one side over a fairly high heat. For .. sorry, I can’t remember how long. But not too long … maybe three minutes? Enjoy the sizzling sound. And then turn it over. And let it cook on the other side until the pink in the middle of the steak goes a pale white. Another three minutes? Whatever. I don’t like raw fish unless I am eating sushi or ‘crudo’ or ceviche but I do know that swordfish must not be overcooked either. Sprinkle a little salt at this stage. Once I think it is done … I cut the steak in half. Half for me and half for my favourite husband. Plonk the halved steak on the seving dish, over the slices of orange and surrounded by blanched asparagus. Serve on the individual plate. It was lovely. Not overpowering, and the tang of the orange and lemon making it very fresh. And the ‘secret’, very discreet, ingredient, the grated pecorino, contributing that sense of fatty satisfaction that can only delight a palate. I was lucky, I had intuited how much pecorino to mix into the sauce. Any more and it would have been too much.